A new camera shows the spread of radioactive particles in a village near the Fukushima nuclear facility. One year after Japan's nuclear disaster, the invisible threat of radiation still lurks around homes and businesses near the Fukushima Dai-ichi power plant. Now, a new camera based on Japanese space technology has allowed humans to see the radioactive contamination around the nuclear plant's emergency evacuation zone. Such camera technology works by detecting radioactive particles that give off gamma rays — the highest-energy form of light in the universe. The Japan Aerospace Exploration Agency (JAXA) originally developed the technology for an upcoming X-ray observation satellite, called ASTRO-H, but successfully adapted the camera to spot Earthly radiation threats such as Cesium 137 and Cesium 134. 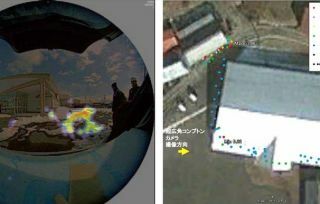 The camera's wide 180-degree vision showed radioactive particles spread across the ground and on rooftops of the village in the Fukushima Prefecture during a field test Feb. 11. Its results proved more accurate and capable of capturing a broader snapshot of the radioactive zone than existing cameras. A series of camera images shows radioactive particles over time at a village near the Fukushima nuclear facility. Such a space technology spinoff can also spot radioactivity in hard-to-reach places — such as building rooftops — where traditional survey meters can't go. Researchers from JAXA, the Japan Atomic Energy Agency and Tokyo Electric Power Co. took part in testing the "Super-wide Angle Compton Camera" prototype. They plan to continue developing the camera for practical use in radioactive material decontamination work. Some residents of the region surrounding the Fukushima nuclear plant have begun moving back to homes and farms. But Japan's government has kept a "no-go" zone that extends 12 miles (19 kilometers) around the nuclear facility because of the radiation threat.